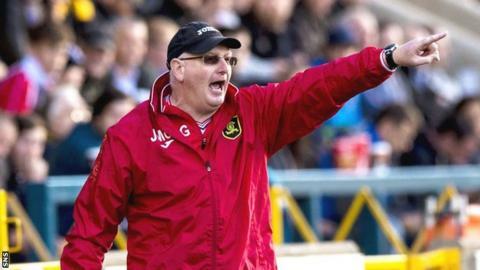 John McGlynn has left his manager's position at Scottish Championship club Livingston by mutual consent. The former Raith Rovers and Hearts boss, 52, took charge of the West Lothian outfit in becoming their fifth manager since Gary Bollan was sacked in February 2012. Player-coach Mark Burchill has been appointed caretaker manager until a new manager is appointed. Livingston are four points adrift at the bottom of the table. They were by the Scottish Professional Football League for non-payment of tax in 2010-11 and face the as former director Ged Nixon claims the West Lothian side owe him more than £300,000. "The club wish to go on record in stating their appreciation for the work John has carried out under extremely difficult circumstances this season." A club source told BBC Scotland that if Nixon succeeds, Livingston may not be able to pay salaries and could enter administration for a third time in a decade. McGlynn issued a statement thanking the fans and all staff at the club, and added: "I acknowledge that it is a results business and unfortunately no matter how hard I worked, we could not get the results we all desired. "I feel it is now time to let someone else come in with plenty of games remaining in the season to turn the club's fortunes around. "I would like to wish the club every success in the future. I believe they will stay in the league and have a great chance of lifting the Petrofac Cup." A club statement said that McGlynn had left "by mutual consent". It stated: "The club wish to go on record in stating their appreciation for the work John has carried out under extremely difficult circumstances this season."